Firefighters late Tuesday were working to fully contain a two-alarm brush fire that prompted shelter-in-place and evacuation orders in Dublin. 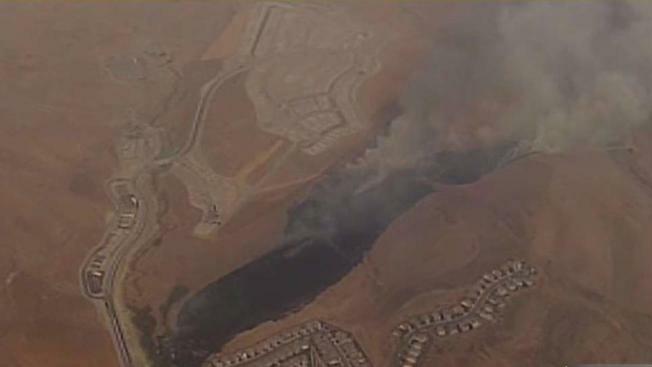 The fire erupted earlier in the afternoon in the area of Tassajara and Fallon roads. Heavy smoke from the blaze, which officials said charred at least 118 acres, triggered a shelter-in-place order for the Dublin Ranch (east side of Fallon) and Positano communities. Evacuation orders were also issued, but later lifted for nearby neighborhoods. The fire late Tuesday was 75 percent contained, officials said. Mandatory Evac for following Streets: Signal Hill east of Fallon to Cog Hill Ter to Saddle Creek Ter. Avellina Dr north to Ducale Wy. Dublin: Firefighters are at the scene of a veg fire in the area of Tassajara & Fallon. Approx 5 acres. No reports of structures threatened. Dublin Update: 2-alarm veg fire in the area of Tassajara & Fallon Rd is approx 30 acres. Moderate rate of spread. No structures threatened. Vegetation fire in the area of Syrah Dr. east of Tassajara Rd. Syrah Dr. residents stay clear of the area.